What happens when you are left with boring pieces of bread at home without much options besides butter, jam or omlette? You either end up forcing yourself to sandwich them or throw them after they turn stale. I chose to give the bread pieces a nice twist and turn them into an interesting poha. This is bread poha. No, I hold no patent of invention. This dish has existed for years! I am sharing a quick, light and healthy breakfast fix with you all. 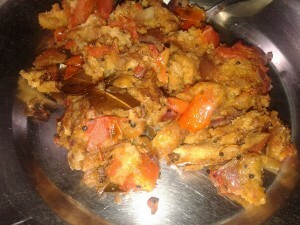 Things needed- Heavy bottomed pan, cooking oil, Bread pieces (any type), tomatoes, onions, mustard seeds, curry leaves, salt. 1. Cut the bread pieces into cubes. Slice onions and tomatoes. Keep these aside. 2.Heat oil in pan. Add mustard seeds. Optionally you can add peanuts or raw chana daal in oil and fry them till they brown. (I skipped peanuts, as they are not too healthy). Add curry leaves and dried red chilly, once mustard seeds start crackling. 3. Add onions to the pan.Keep stirring till onions turn light brown. Add the diced tomatoes. When the tomato dices turn pulpy and start to dehydrate, add bread cubes in the pan. Add salt to taste. 4. Stir the content in the pan and add a little water. Garnish with coriander leaves. Serve hot. I used brown bread for this dish. You can use multigrain bread as well. Any kind of cooking oil can be used, be it ghee or refined oil. I used mustard oil. This healthy, lip smacking dish barely takes 10 minutes. This preparation is low on cholesterol and has the necessary spices required by body for daily metabolism. Caution- Do not over cook the dish and do not add too much oil. While shopping for groceries in super markets, you see the attractive colorful packs of carbonated drinks or fruit juices and get into a dilemma of whether or not to buy. Thanks to your calorie intake and unhealthy lifestyle. Trust me, to control and restrict your calorie intake is not only difficult, but at times next to impossible. The cliche "I will work out tomorrow" urges you to load your shopping trolley with colorful packs of drinks. So how does a person cut down on this unhealthy intake? Paper Boat comes to your rescue. Especially for the tea lovers, who cannot say no to tea and slurp on the sugary liquid. 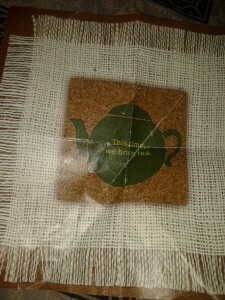 Having tried the aam panna drink from this brand, my expectations were high from the ice tea packs as well. The expectations were met! Lemon and ginger tea and tusli flavours come our as the most rejuvenating ice tea flavors. For tea lovers this is a blessing, as you do not often get flavored ice tea! The most common ones we have heard is lemon ice tea, right? Lemon & ginger ice tea gives a little spicy taste due to the blend of ginger. Tusli ice tea is the better of the two with a healthy and cool brew of tulsi or basil. The best part is low sugar content, which means low calories and low fat! Refrigerate the tetra packs and have a cool refreshing drink quenching your craving for low-sugar yet energizing drink. The attractive use-and-throw packaging is very pleasant to look at and user friendly. Tightly sealed cap and plastic doypack promises zero spillage and tear. Each pack is priced at INR 30 which I think is slightly higher. I guess INR 25 would have been a fair deal for these. The tagline on the packs says drinks and memories. 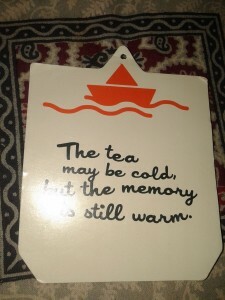 How can the brand create memories? Well, the cute packaging with the water bubbles and paperboat as the name as well as a doodle, just gets the nostalgia out! 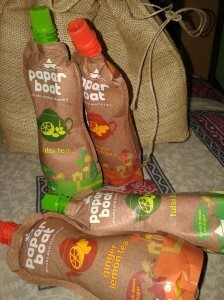 A product of Hector Beverages, clever marketing of Paperboat is grabbing eyeballs. Being a health conscious person, I am glad to have found a drink that suits my needs and taste. I would rate it 3.5 on a scale of 5. Watch the paperboat youtube video here. Nostalgia will leave you in tears.